Miss Meadows' Pearls - Fashion, Photography, Alternative Model, Burlesque, Vintage Miss Meadows' Pearls: Playsuits! Yay! Summer is coming even this year - I hope... And with that, temperatures that requires less fabric on our bodies - like, for example, playsuits! Or rompers as they are also called. I like the word romper. It sounds fun, and a bit naughty somehow. The romper appeared in the US in the early 1900s as playwear for younger children. In the 1950 they became very popular among grown women too, who wore them as leisure- and beachwear. During the last few years they have come into fashion again, and can be found in both modern and vintage inspired versions. Nowadays people even wear them to parties, matched with high heels and clutch bags. Here are some of my favorite pics from the web! This one, from Emmy Design, comes in different colors. But I like it in light pink. It doubles as a swimsuit, has sewn in bra padding, a skirt-like detail at the front, and is made of bengaline - which is true to the swimsuit materials of the 40s. Here is one with a cat in lace on it! Perfect for crazy cat lady-picnics! It comes from ModCloth. 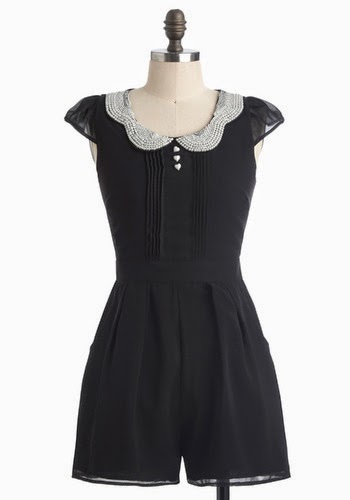 Another one from ModCloth, the so called Romance Columnist Romper. This is actually a bathing suit. But together with it's removable faux sarong skirt, I think it works very well as a romper too! It also has a built in bra. You find it at Revamp Vintage. Another bathing suit that fits equally well as a romper. Also from Revamp Vintage. It has a boned bodice and a removable skirt. Now I feel like having a romper party! Cocktails for everyone!!! So pretty! I doubt I will look good in one, but I like the ModCloth page! Have you bought anything from them? Are they good?